This is one of two Chabrier songs with this title. 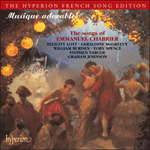 Much better known is the piquantly humorous Lied to a poem of Catulle Mendès which can be heard on CD2. Once again Chabrier (as almost always) proves himself quite unlike the other composers of mélodie. The tempo marking is ‘Allegro appassionato’; halfway through each strophe the vocal line is marked ‘con passione’ – this is no gentle admonition to a salon singer but a command shouted from the wings of a theatre. This composer had little patience with what he saw as the pussyfooting refinements of the salon, and here we encounter an early example of his preference for big brush-strokes and large-scale tunes that expand across entire strophes of the poet’s text. The song is conceived in a large sweep and the accompaniment whirls impetuously by, the speed dictated by the almost unreasonable demands made on the singer’s breath by the long phrases and pedal points. The almost comically extended settings of the words ‘prunelle…’ and ‘ambroisie…’ , require the singer to hold on to four successive semibreves as the piano’s basses gradually fall back to the tonic. The piano writing is, as always, a portrait of the composer’s own enthusiasm. In the eight-bar introduction single crotchets in the left hand are offset by three semiquavers in the right. The result of many repetitions of this pattern is a slew of glistening notes which trace the hidden contours of a long melody before the voice takes over with a new long-breathed melody of its own. If one has the refined rise and fall of the mélodies of Fauré, Debussy or Ravel in mind, this type of vocal enthusiasm may seem to be a bit rude (in the French sense of ‘rough’ or ‘harsh’). There is no trace of the cultivated whisper in this music which one hears in the differently adorable works of Reynaldo Hahn for example. Chabrier demands a manly presence from his tenors merely in order that they should counter, and climb above, the rumbustious piano writing. A heart-on-sleeve singer filling his lungs and giving his ‘all’ is something that both delights and amuses this composer who is a highly sophisticated boulevardier playing at being a naive country yokel – or vice versa. Great-hearted and unselfconscious outpourings are Chabrier’s stock-in-trade and he is pleased to subvert what might be expected of him by ‘respectable folk’ in writing songs; indeed he is subversive in this way again and again throughout his career. The composer’s ideal in this voice type was his friend Ernest Van Dyck who was the first French Parsifal. The heroic edge to this song, even on such an unheroic subject, belongs unashamedly to the theatre and the world of pre-Pelléas French opera which make tough vocal demands on their tenors (the operas of Bizet are an example of this). There is much recital music in which the opera singer sounds inappropriately like a bull in a china shop, but here is music, poised between the two arenas, which actually requires a larger-than-life vocal commitment within the confines of writing which simultaneously calls for delicacy of feeling. The composer’s manuscript has three verses of Banville’s poem; the Delage edition prints a further three from the poet’s total ten (thus a strophic repetition of the whole song). The composer’s manuscript implies that this was his wish. Que la neige et l’aurore. Something of a child’s down. Are the snow and the dawn.